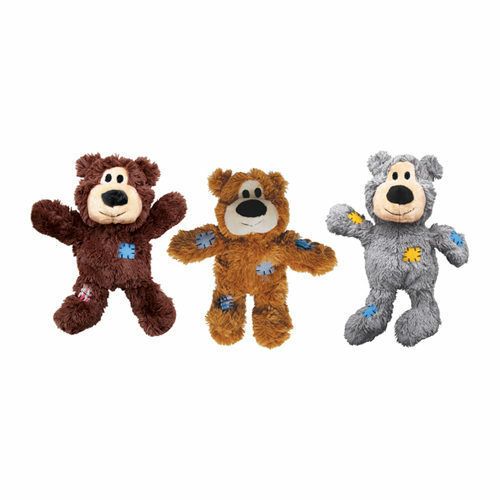 KONG Wild Knots Bears are cute cuddly bears for your dog. These bears are durable and strong on the inside. The inside of this cuddly toy consists of a skeleton woven out of rope, which appeals to the dog's natural instincts. The outside consists of strengthened plush material. Your dog will enjoy cuddling with these toys. KONG Wild Knots Bears are cute cuddly bears for your dog. These cuddly toys have a strong sisal rope skeleton on the inside. This stimulates your dog's natural instinct. The outside of this cuddly toy is made from strong and durable plush material. Your dog will love this cuddly toy. These cuddly toys are delivered at random, you cannot select your colour. Have you used KONG Wild Knots Bears before? Let us know what you think about this product.